New figures from Homes England indicate the organisation’s growing influence within the English housing market. 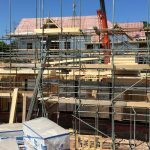 Homes England, the Government’s housing accelerator, has reported that for the six months between 1st April and 30th September 2018, the programmes it manages started building 15,766 homes on site and completed a total of 15,704 homes. These figures represent 15 per cent and 31 per cent increases on the first half of 2017-18. A total of 5,857 homes for market sale were started in the six months to 30 September 2018 – a 13 per cent decrease on the same time last year. However, the number of market sale homes completed in this period was up 69 per cent to 4,613, compared to 2,737 last year. Genesis Homes has secured a £4 million funding loan with Homes England to support the delivery of 37 new homes.